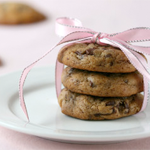 Apologies for not posting last week, as I was getting ready to teach a cookie class at Tante Marie’s and prepping for the 2012 SF Blogger Bake Sale announcement. 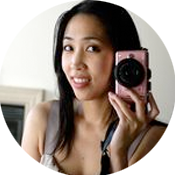 As amends, I hope you enjoy the extra-abundance of photos in this post, where I share a few snapshots from my trip to Vietnam. While I was in Hong Kong over the holidays, we made a quick side trip to South Vietnam. It wasn’t nearly enough time to do this beautiful country justice, but I hope the following shots give you a little taste of my experience! We arrived in Saigon late evening. 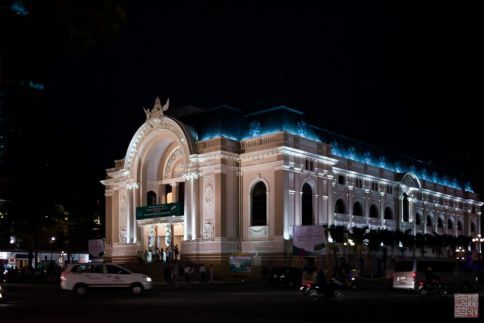 One of the first sights we saw was the opera house – a beautiful example of the French colonial architecture. 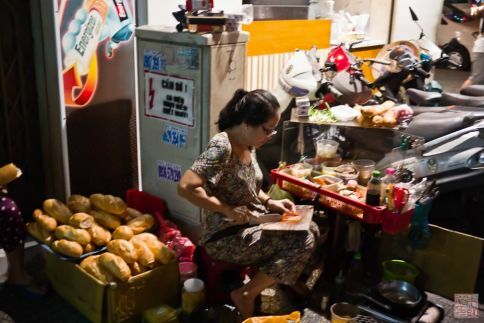 A streetside vendor of banh mi. I loved seeing these little shops set up in every unexpected nook and cranny around the city. 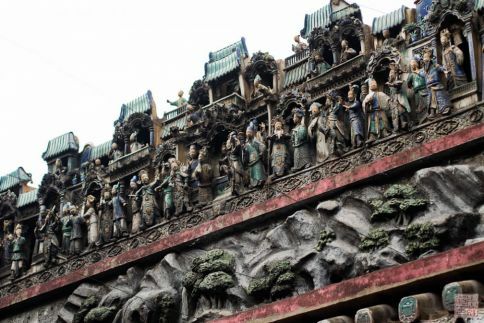 Some astonishingly detailed porcelain figures at the Thien Hau Pagoda, in Cholon, the Chinatown district of Saigon. Incense being lit in the temple. The coil slowly burns out, filling the temple with fragrant smoke. 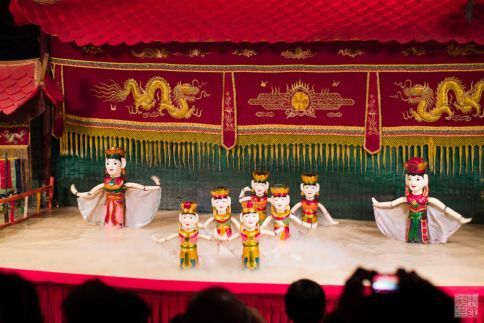 A Vietnamese water puppet show. This unique take on puppetry is spellbinding to watch. The puppeteers are hidden behind the backdrop and control the puppets with rods that run beneath the water surface. As the puppets move, they are accompanied by traditional music and singing, all combining to recreate scenes of rural life or old folktales. 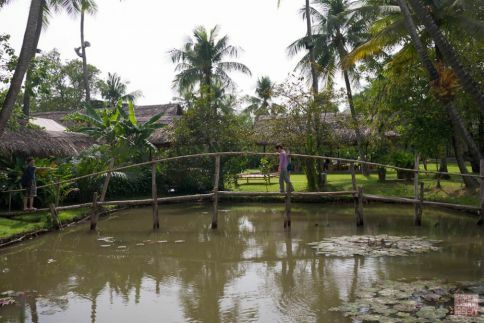 My mom crossing a very slender bridge over a pond in a botanical garden. 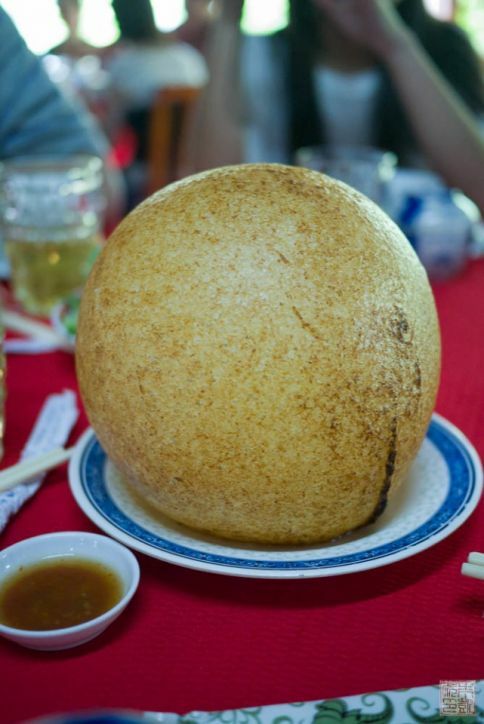 One of the more eye-catching dishes we discovered: Xoi chien phong. These basketball-sized puffs of fried dough are brought to the table for all to admire, then broken into crispy/chewy shards. I found an in-depth explanation (with photo accompaniment) of how these balls are created. 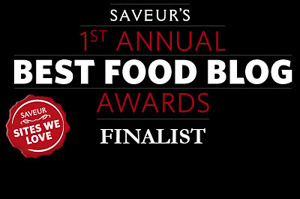 Seafood, not surprisingly, is a star attraction of the cuisine. 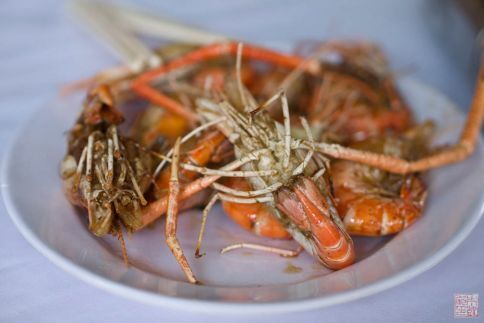 We encountered these giant prawns (or some sort of crustacean) quite often on the menu. 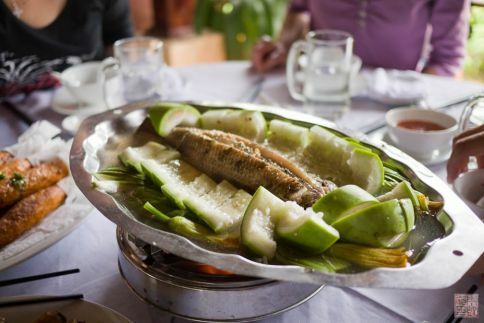 More seafood: some steamed fish covered in winter melon. 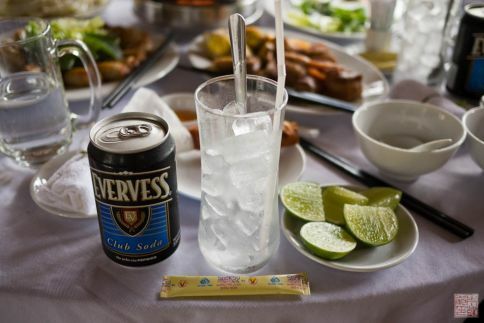 Lemonade, the Vietnamese DIY way. We also went south of Saigon to Ben Tre, a province at the delta of the Mekong River. 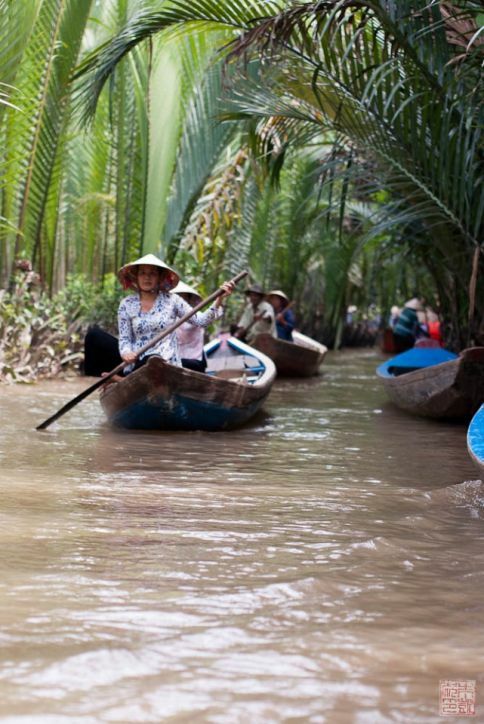 The Mekong rules here, cutting numerous canals large and small through towering, lush jungles. While motorized boats travel up and down the wider portions of the delta, small boats like these are still used to navigate some of the smaller passages between tiny islands. We had the chance to be ferried down one of these small rivers by some very hardworking paddlers. 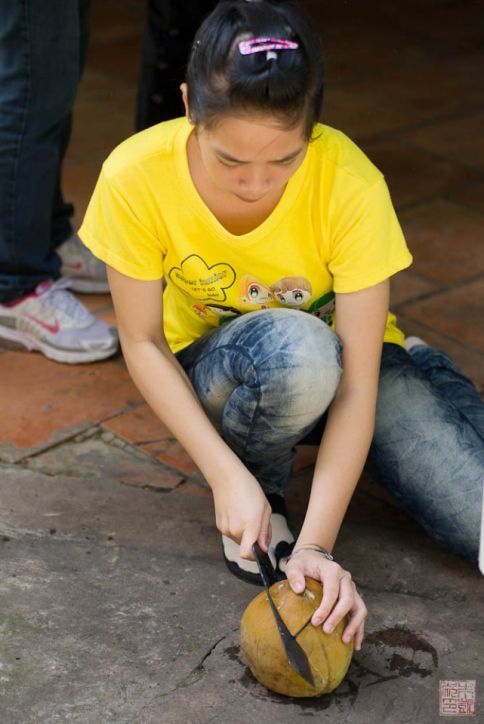 A young woman chopping open a fresh coconut – a common refreshment for a hot day. 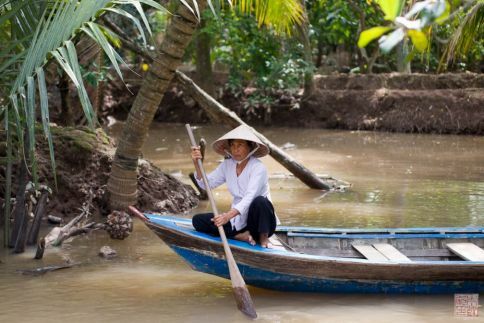 The Mekong Delta is also home to water coconut, a relative of the “regular” coconut. 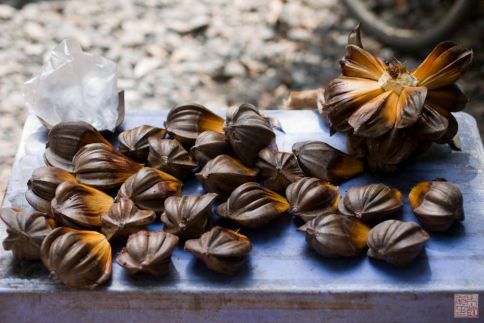 We saw them everywhere in Ben Tre and they have a similar taste to their more commonly known cousin as well. No surprise with the abundance of coconut, that coconut candy is a specialty of the region. 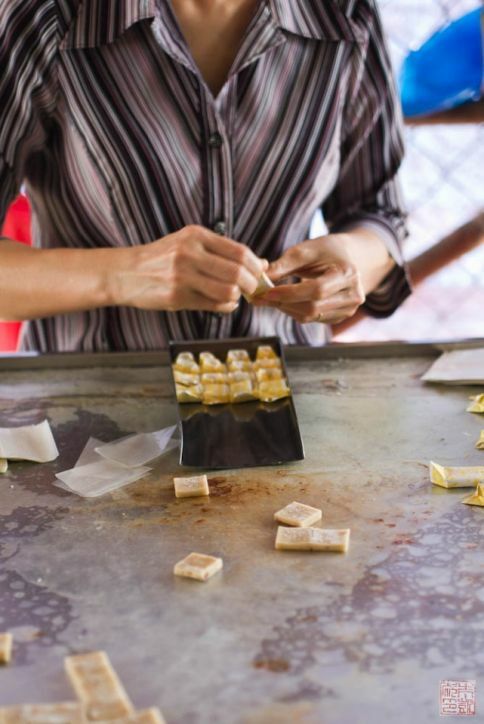 Here a woman is wrapping the chewy, taffy-like squares for packing. The final product, ready for eager customers. 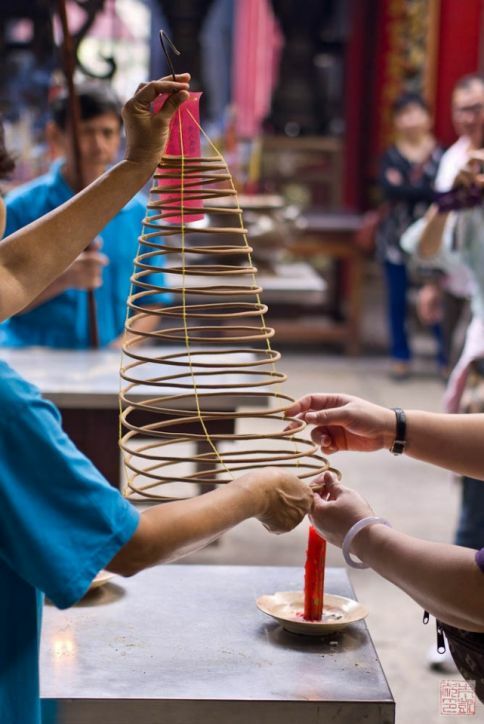 The entire candy-making process takes place in the shop, from the pressing of the coconuts to the cooking of the coconut milk and sugar mix, to the candy-wrapping, and the air is thick with the scent of coconut and sugar. So much fruit! One benefit to the constant heat and humidity is the abundance and variety of fruit everywhere. 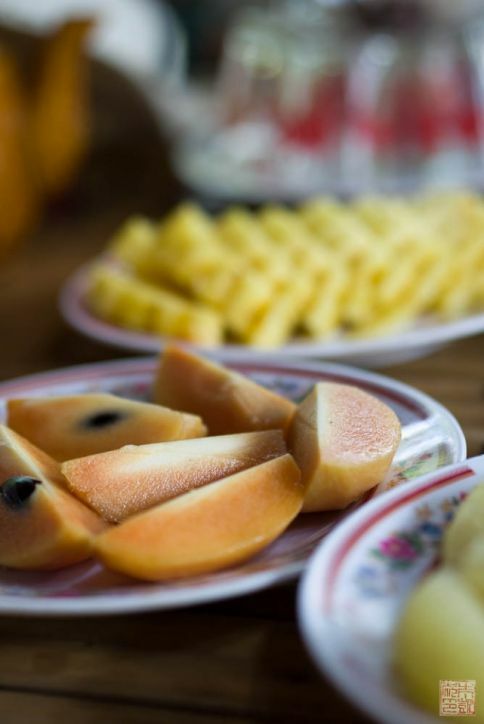 After a hot afternoon cruising around the little islets of the Mekong Delta, these plates of pineapple, papaya, mangoes, and jackfruit were very welcome. A stop for more fruit at a roadside rest stop – yes, those are durians you see in the foreground. My favorites were cherimoyas, also known as custard apples. Their unassuming, pale green skins hide a snowy white flesh with a custardy consistency (hence the name) and a very sweet flavor – kind of a cross between banana, strawberry, and mango. It pretty much taste like the essence of the tropics. 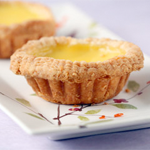 Who was a fan of durian? If you guessed me or any of my family, you are wrong. The only non-Asian member of the party is, in fact, a huge fan of this infamous fruit and couldn’t resist the chance to eat some in Vietnam. We made him sit at a separate table. 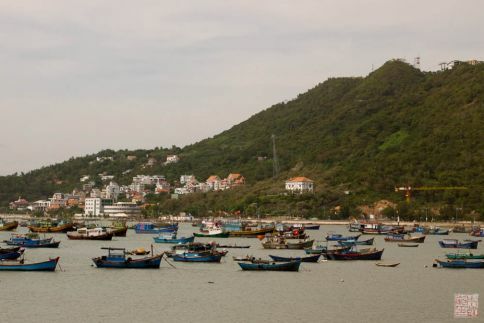 Finally, we passed through Vung Tau, a coastal town popular famed for its beaches. 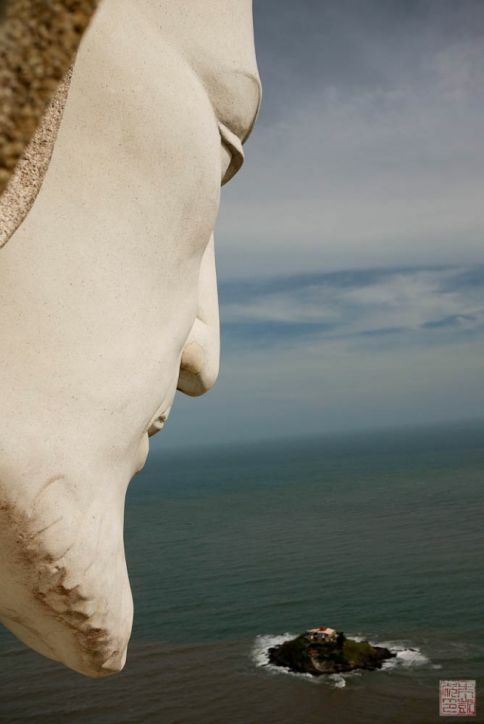 Vung Tau also boasts a huge, 32m tall statue of Christ on top of a hill, overlooking the ocean. To reach the statue, you have to walk up steps built into the hill – about 1000 of them. Climbing 1000 steps in about 85 degree heat – maybe not my favorite vacation activity, but the view at the top of the statue (you can climb an additional 133 steps inside the statue to emerge on Jesus’ shoulder) is worth it. 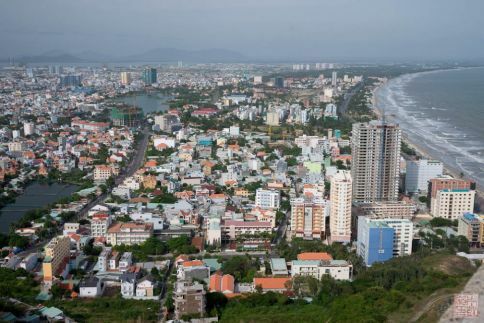 View of the Vung Tau coastline from the statue. A dinner of fresh clams that evening (followed by more giant prawns). 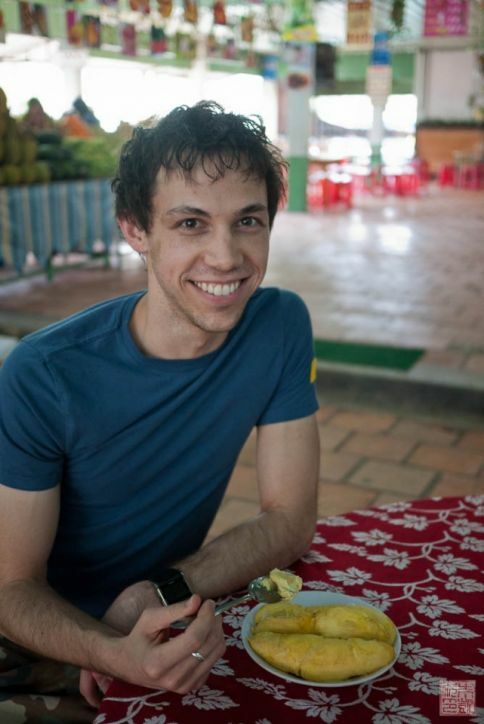 I didn’t get to try too many desserts in Vietnam – a plate of fresh fruit was often all we wanted or needed – but I talked to some good Vietnamese friends back here in the states and tried to come up with a combination of some popular flavors. The result is a pandan and coconut ice cream with a cashew palm sugar brittle of which I’m pretty proud. 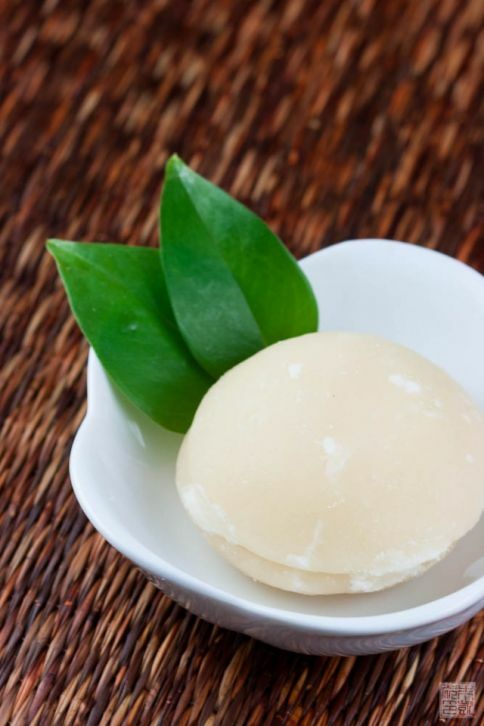 I discovered pandan leaves a while back; if you don’t have an Asian market nearby, you might be able to find some pandan paste/extract online. 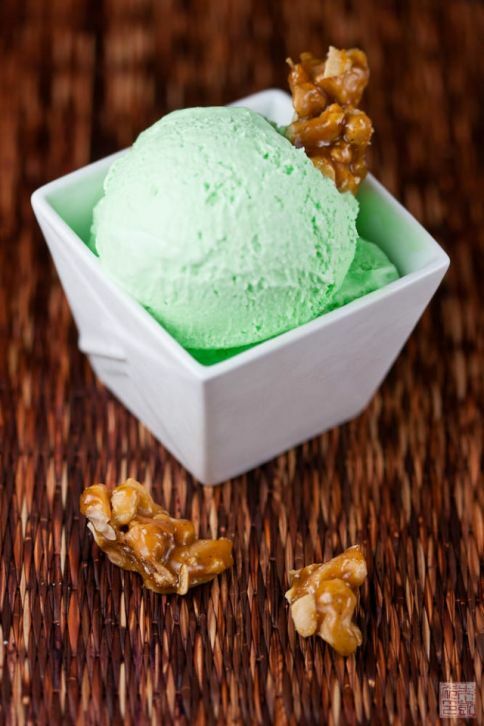 The only trick is that pandan paste is usually colored an unnaturally vivid green, so while I was trying to balance out the coconut and pandan in this recipe I found that I was adding so much extract that my ice cream was turning shamrock green (too bad I didn’t post this on St. Patrick’s Day!) In the end I reduced the amount of coconut to let the nutty, toasty pandan flavor come through. If you find pandan leaves, you probably won’t have as much of a problem as the juice extracted from them is not quite that vivid. I would steep about 6-7 of the leaves in the heated cream-and-milk mixture, and add just a teaspoon of the pandan paste for added flavor. Combined with the coconut, this makes for a rich, lush scoop of ice cream. The cashew brittle is adapted from a recipe I found in Pichet Ong’s The Sweet Spot, a great cookbook of Asian-inspired desserts. Instead of making a regular sugar caramel, I decided to use palm sugar. This sugar made from the sap of various types of palm trees has more of a brown sugar flavor. 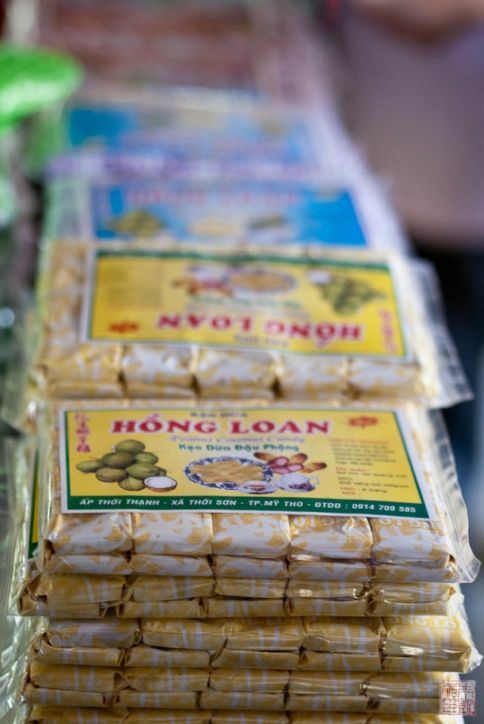 The palm sugar I usually find in Asian markets comes in solid blocks like in the photo above, which I simply melt down on the stove. However, it appears there are granulated palm sugars appearing in specialty/health food stores, which would be easier to work with. I understand there are differences between various palm sugars, which I’ll try to explore in a future post. 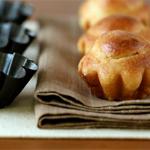 But for this recipe I found the blocks of palm sugar to work fine. The palm sugar caramel is mixed with sesame oil and a dash of salt and black pepper, which gives the brittle an addictive spicy-sweetness that also helps cuts the richness of the ice cream. 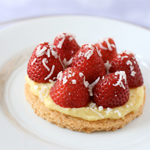 It’s easy to eat by the handful, and even better with some ice cream to cool the throat afterwards. Spicy interspersed with refreshing – kind of like our trip to Vietnam. 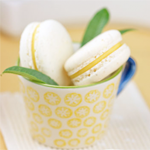 If you can't find pandan leaves or pandan extract, you can substitute vanilla extract for a similar flavor. 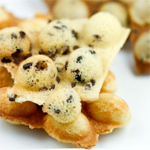 The brittle is adapted from Pichet Ong's The Sweet Spot cookbook. 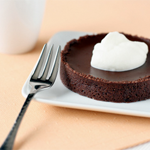 Combine cream, milk, coconut milk, and sugar in a large saucepan. Bring to a boil over medium heat. Remove from heat and add in salt and pandan extract. Stir to combine. 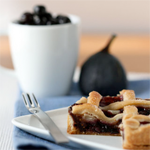 Pour mixture into a clean container, cover, and chill in refrigerator until thoroughly chilled, preferably overnight. Freeze in an ice cream maker per manufacturer's instructions. Preheat oven to 325 degrees F. Spread out cashews evenly on a baking sheet. Toast cashews in oven for about 10 minutes, rotating halfway through, until lightly browned and very fragrant. 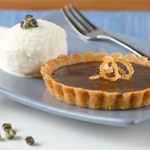 Remove and let cool while you make the caramel. Place palm sugar in a medium saucepan. Heat over medium-heat until sugar melts. If the palm sugar is in a solid chunk, be sure to move the sugar around so it melts evenly. 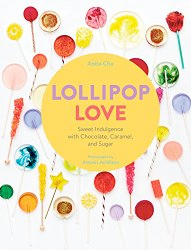 When the sugar has melted, continue letting it cook until it turn dark golden and registers about 350 degrees F on a candy thermometer. Remove pan from heat and add in butter, sesame oil, salt, and pepper. Stir until combined. Add in the cashews and stir to evenly coat with the caramel. Pour out cashews on the baking sheet and separate them with a spatula or fork. Let them cool before eating. This is so unique! Awesome idea! The fruits look delicious. Were there any mangosteens in Vietnam? 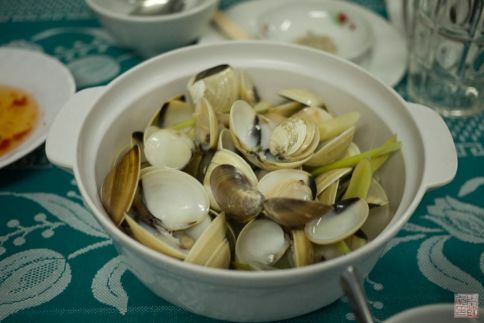 Really beautiful pictures of the food and the scenery in Vietnam! I hope to make a trip one day! This looks amazing! 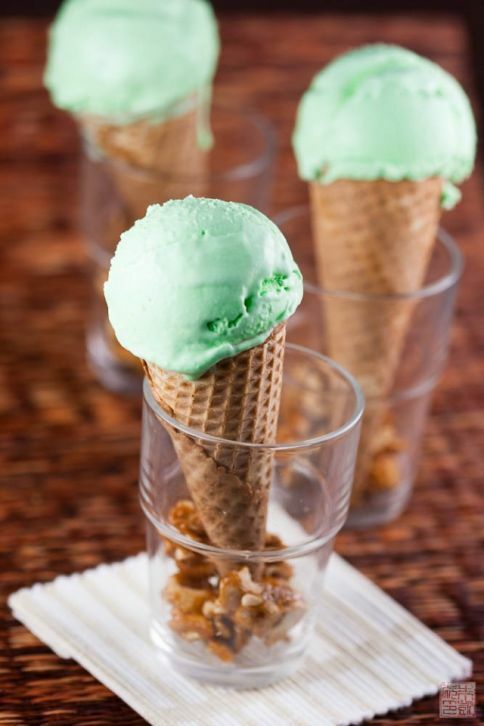 I’m so excited to try the Pandan Coconut Ice Cream recipe. I’m going to head to the store right now to get the ingredients. This ice cream looks so beautiful and refreshing. I know I’m probably going out on a limb here, but have you seen the episode of Top Gear where they travel through Vietnam? Besides their usual antics, they make the country look so beautiful, as do your pictures. I hope to someday be able to travel there as well. The ice cream looks so neat, slick and refreshing! Nice colour too, pale green… Bet you had a great time in Vietnam too! Good job! I LOVE DURIAN!! 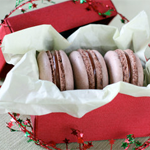 My husband hates the smell, the candies, the taste… everything! Haha. 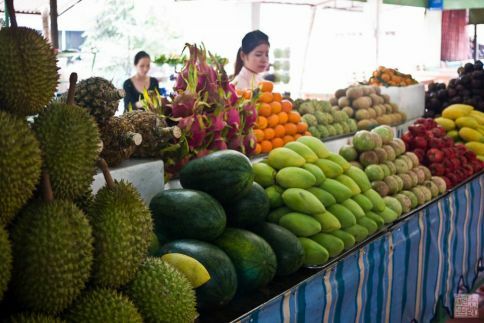 I miss being in the Philippines, there’s so much delicious fresh fruit there!